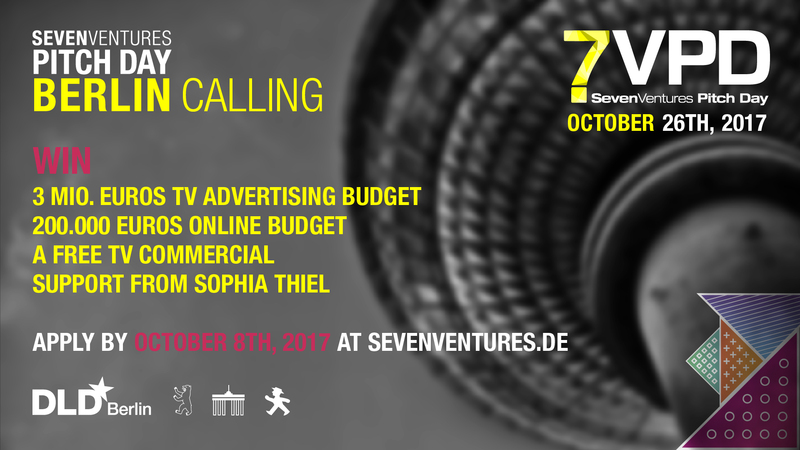 Munich September 5, 2017 – The seventh SevenVentures Pitch Day (7VPD) will take place on October 26th at the DLD Conference Berlin. Effective immediately, start-ups can apply to participate in the competition sponsored by SevenVentures, the investment arm of ProSiebenSat.1, to win a TV and online advertising package worth more than EUR 3 million. Forbes Magazine calls 7VPD the most important global start-up competition. SevenVentures is offering the winner a complete media and service package that includes a EUR 3 million TV advertising budget, EUR 200,000 online marketing budget and EUR 40,000 for the production of their own TV spot. And for the first time the winner will also receive support from a popular influencer. Lifestyle and fitness expert Sophia Thiel will provide the start-up with tips, tricks and sound advice for their entrepreneurial journey. This year the search is on for the most creative and innovative B2C start-ups with unique physical products. These companies should have established a scalable business model and already be at a stage of development where they can master the production demands triggered by a successful TV campaign. Eligible to participate in the competition are both German companies which want to advertise their products on ProSiebenSat.1 TV stations as well as international companies that are not yet active in the German market, but are looking to expand into Germany in the future. Four finalists will have the chance to present their concepts live on stage to an expert jury of industry experts, influencers and well-known media personalities. This year’s panel of experts includes TV presenter and start-up investor Joko Winterscheidt and SevenVentures CEO Florian Pauthner. The three finalists will compete for the 7VPD prize together with the RiseBrewing.Co, the winning American contestant of the New York Satellite Pitch Day 2017. The SevenVentures Pitch Day was established in 2012 and is held annually; previous winners include Tinkerbots, Withings, Cashboard, GetYourGuide and Popsa. Follow 7VPD on Facebook and Twitter.